It is early autumn and the days are cooler, the air crisp, and night arrives more quickly. I have pulled my sweaters out from the closet and am wearing long velvet skirts. The food I buy at the farm stand is round and orange or yellow, and satisfying in a very earthy way. It is harvest time, the fields will soon be bare and most creatures will be inside somewhere (house, barn, nest, den). We are entering the cold, dark half of the year. In addition, it was a time of shifting thresholds. The interplay of day and night, light and dark, fertility and dying away brought with it a spiritual note. Lines could be crossed, from the seen to the unseen, and vice versa. The Celtic holiday of Samhain, originally longer than the one night of modern Halloween, was a time of heady brews. One might get wildly drunk, but for the more serious purpose of rising spiritually higher. Deals were made, between partners, between the living and the dead, or the mortal and the immortal. This fantastic holiday, like many other pagan traditions, influenced Christian practice as Christianity spread through Western Europe, especially Ireland. The symbols we have for Halloween today - the brightly sinister jack o'lantern; the gaudy, ghostly costumes; and laughing witches on brooms, are the result of a gradual evolution of this important, ancient festival. Through Markale's book we can find the real legitimacy for Halloween as a holiday. It is not simply about children traipsing from door to door looking for candy (or else! Trick or Treat!). It is not simply about a reverence for ancestors, or a time to let go of all inhibition. There is a reality to it that gives it a deeper presence, and which beckons us to seek its true meaning, in addition to its true history. Jean Markale's telling of many traditional stories illustrates this history vividly and causes us to reflect on the essential nature of the holiday. Identifying, through Markale's exploration, with our pagan ancestors, gives Halloween the serious reflection it deserves. We can look now at this black and orange night and see beneath the mischievous spectacle, a holiday of changes, of reverence, of comprehension and wisdom. This book is not always an easy read. Translated from the French, some of the writing is dry and a little stiff. It educates more than it entertains, and informs more than it inspires. There are no fun spells to be learned here, no spooky games, and no popular tales of hauntings – as there might be in other books on the holiday. But, it is a good thing to learn the original meaning and power of our holidays, I think. 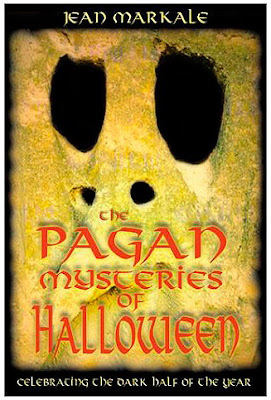 The Pagan Mysteries of Halloween shines a broader light on a very popular and generally lighthearted holiday, giving it more meaning and form than what we are accustomed to. This looks like an informative read. Thanks for sharing!